I recently wrote about creating a Voice-Controlled TV remote using an Arduino Uno. One limitation of that design is very short range which is caused by the relatively small current flowing through the LED. This limits its range to just over a foot. This can be improved by increasing the current through the IR LED closer toward its rated maximum. However, the Arduino can only source about 40 mA of current from digital output pins (and has a total microcontroller source limit of 200mA) while the rated maximum of the IR LED I picked up can take about 100 mA. 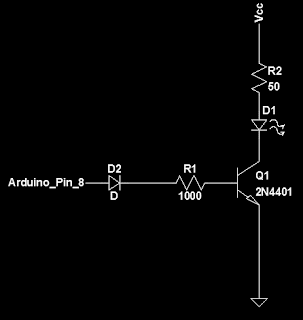 Schematic of an improved IR LED driver circuit utilizing a NPN transisitor as a switch. Where beta is the DC current gain (sometimes called hFE). Usually Ic / Ib is chosen to be less than beta by a factor of 2 to 10. 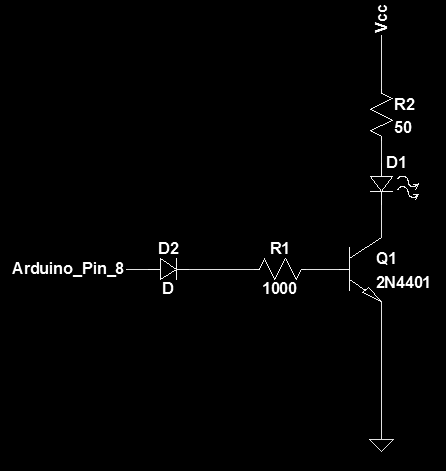 This ensures the transistor is at saturation when Arduino Pin 8 is set high. This circuit is limited only by the maximum NPN transistor collector current (see datasheet; 600 mA; which would require Ib to be minimally 12 mA, which is within the ability of the Arduino to source) and the maximum rating of the IR LED (100mA for the LED I bought). I also used a free circuit simulator from Linear Technology called LTSpice to simulate some circuits to make sure my calculations were correct. There is a great tutorial with a link to the download page (tutorial link). Give it a try for your projects! I am not affiliated Arduino or any of the retailers mentioned above. I have not accepted compensation in any form from any organization in support of this project. Use this information at your own risk. I am not responsible for any adverse effects your use of this information causes. I am a research and recreational programmer. In 2014, I received my PhD in Biochemistry & Molecular Biology and I am currently finishing a medical degree towards a career as a physician-scientist. My undergraduate background is in Electrical Engineering, Engineering Physics, and Molecular & Cellular Biology. (c) 2011-2012 BioPhysEngr. Simple theme. Theme images by RBFried. Powered by Blogger.